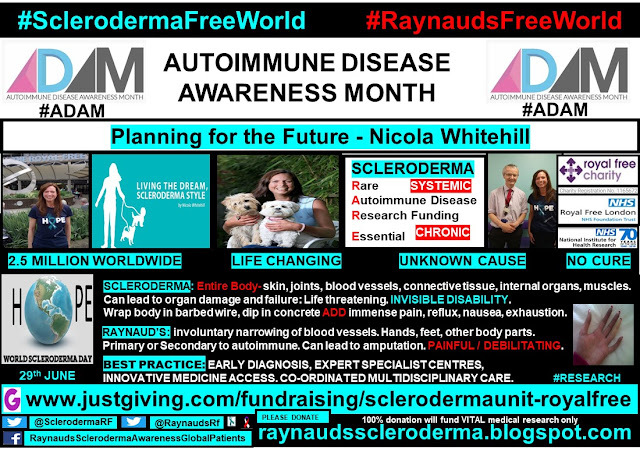 Raynauds Scleroderma Global Patients: Planning for the Future, Nicola Whitehill. AUTOIMMUNE DISEASE AWARENESS MONTH. 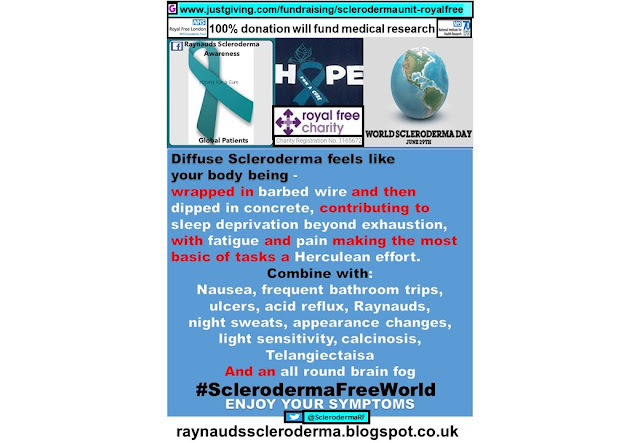 Scleroderma, Raynaud’s. Rare Autoimmune Disease. Planning for the Future, Nicola Whitehill. AUTOIMMUNE DISEASE AWARENESS MONTH. 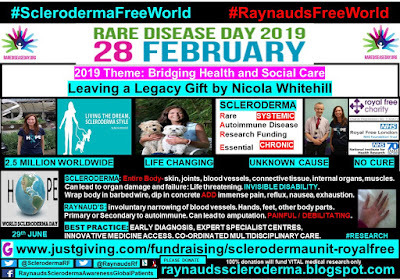 Scleroderma, Raynaud’s. Rare Autoimmune Disease. 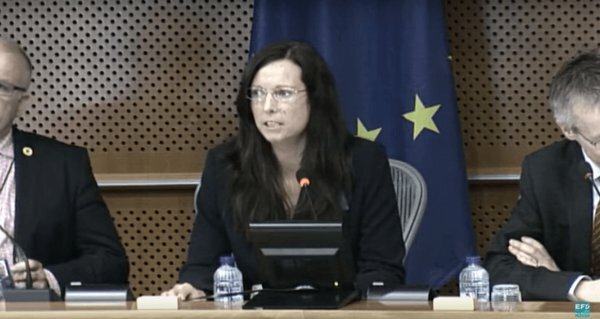 Planning for the Future – Nicola Whitehill. 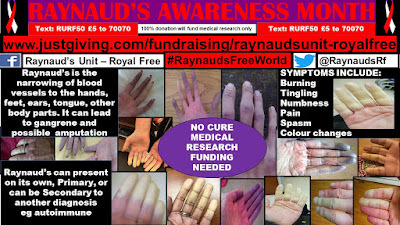 Scleroderma, Raynaud’s: Rare Autoimmune Disease. 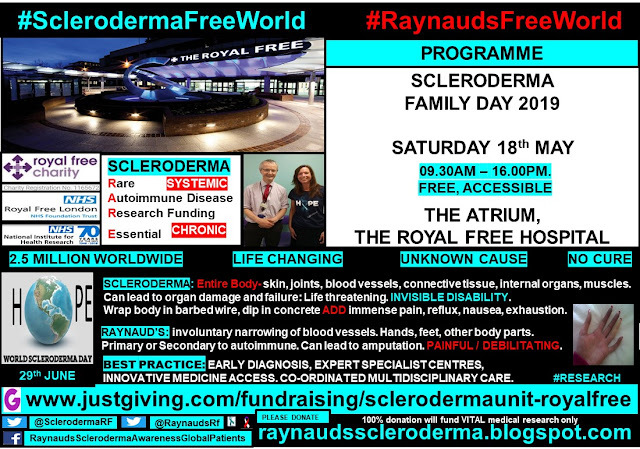 Over the last two decades, my condition has enabled me to see first-hand how the Scleroderma Unit at the Royal Free Hospital has developed and grown. 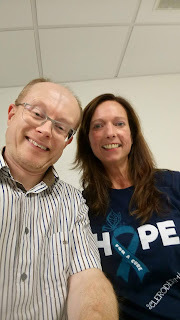 The work of, and support, given by this world-renowned centre of excellence for care of patients with scleroderma and connective tissue diseases are simply exceptional. 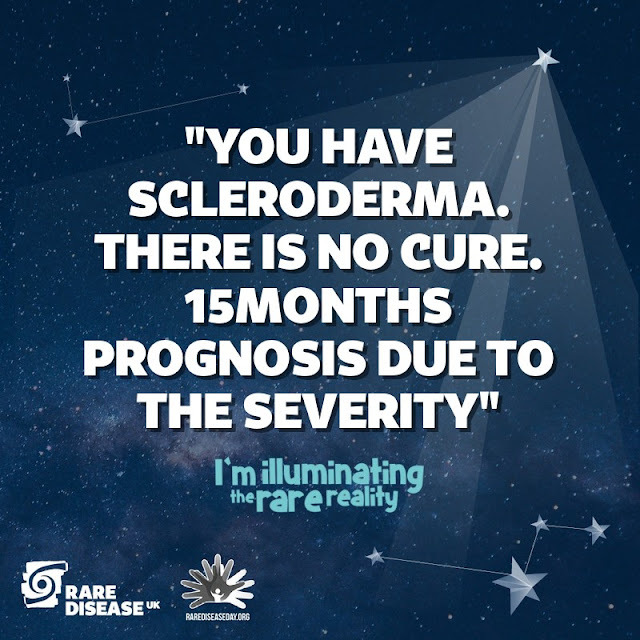 The clinical trial unit is very proactive, which provides me with immense hope that the causes of and a cure for scleroderma will be eventually discovered, and hopefully during my lifetime. 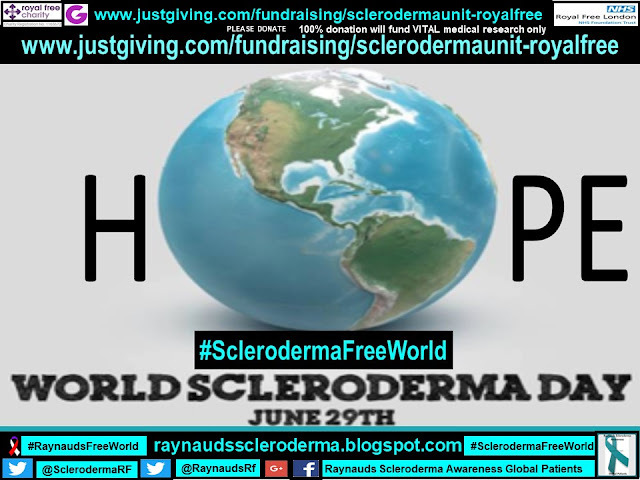 Sadly, I have also lost many friends to scleroderma and I know that I am a lucky scleroderma patient. Lucky, as I continue to survive, and lucky, as I have minimal internal organ involvement. 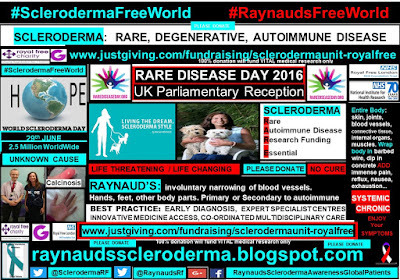 I am sure this is due to me having a relatively early diagnosis and treatment plan provided by the Scleroderma Unit. For over 20 years, I have lived with the daily uncertainty as to whether my disease would ravish my body to the point that medical intervention is futile. It only follows that any sensible person in my position would sort out their personal affairs. This has made me think about what my wishes would be, in looking after my loved ones when I am no longer here, and to think about my making my Will, so that I can have peace of mind that my wishes will be followed. 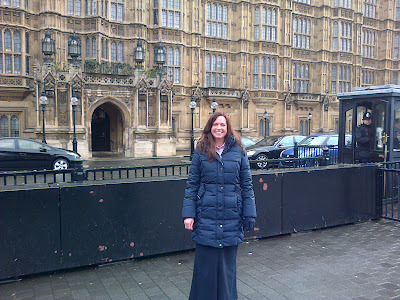 As a patient, I am immensely grateful for the work and support of the Scleroderma Unit over the last 20 years. As a world leader in its field, the Unit’s input into global partnerships and collaboration is crucial for the advancement of medical research. 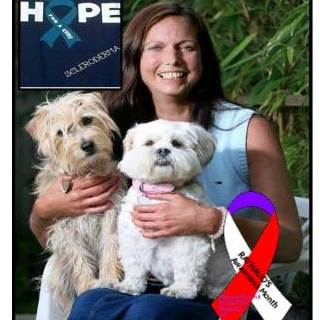 So as well as looking after my loved ones, this is why I am leaving a gift in my Will to the Scleroderma unit. 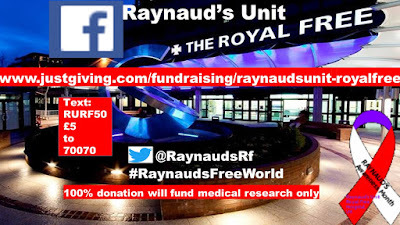 I know that the money will be used to support global medical research into treatments, and eventually a cure for Scleroderma. I have decided that there is no time like the present, and I have taken advantage of the free Will writing service offered by the Royal Free Charity to make my Will, and to ensure my wishes are fulfilled. Making my Will could not have been easier. I am extremely impressed with the professionalism of the service which I received from the free and independent Will writing scheme. The whole process was treated with sensitivity and at no time did I feel under any pressure or obligation to rush the process. I chose which firm, and who, I wanted to assist me with the contents of my Will. The local solicitor was efficient and thorough, making the experience a little more comfortable by not drawing out the process.